Once I receive the email, there’s have something that I felt I must go. Since I long time didn’t go for camp, why not this time I try. Nomad Adventure is proud to announce that after a grueling year of adjusting and improving their processes, they are now… ISO 9001:2008 certified! With this, they are the only adventure company in Malaysia to have such a quality management system certification. This is for 3 person and Nomad so nice to give this room to me & my friend. This is the room for two people. Wan Ling showing us the Tree House. 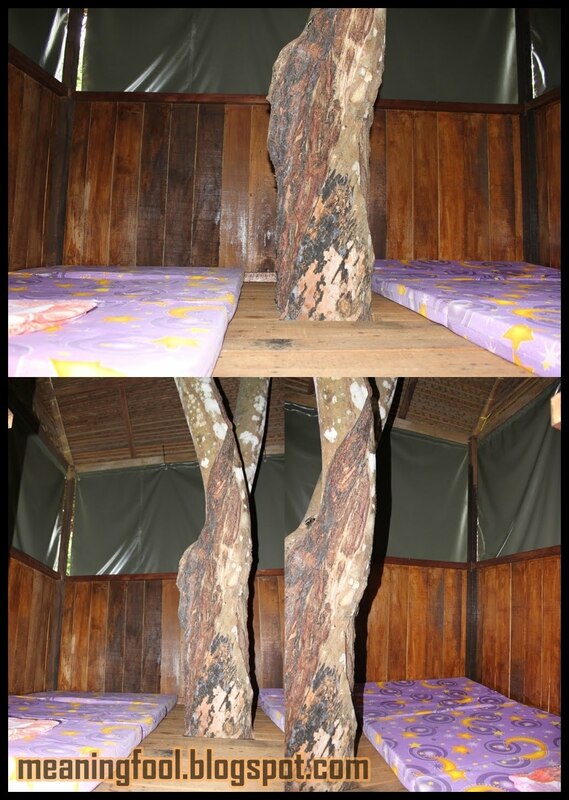 The tree house are Handcrafted from wood, their tree houses are cosy dwellings for 2 persons. 4 persons can squeeze in sardine style into the 8 foot x 10 foot house. To differentiate it, very easy. just look at their window. The 3 person per room the window is from wood. For 2 person, the window from green color cloth and there have a tree on the middle of the room. They have a total of 14 tree houses. Each tree house has a light and two plug points. At Earth Camp their bathrooms and toilets are re-purposed from polycarbonate water tanks. Each unit has either a sit-down toilet or a shower. They have cut a door in these tanks to provide a private bathroom that is easily kept clean and well ventilated. The doors are lockable from inside. They all do by theirself!!! Re-purposing is an off-shoot of re-cycling where items meant for one purpose are re-used for another, possibly better purpose. They choose to use the polycarbonate water tanks as they are highly UV-resistant and provide a minimalist solution to our bathroom needs for Earth Camp. Can you guys guest what it is? It’s a house that made by malt for just around 3month++. Earth Camp is a social enterprise run by Nomad Adventure. They provide adventure and environmental education activities that foster within people from all walks of life the appreciation, knowledge, values and skills necessary to inspire ecologically-sound decisions and actions. They provide 1-day, 2-day or longer programs for those who love to learn in the out-of–doors. Through a variety of adventure and experiential activities, campers will investigate the natural environment of our river, forest and karst ecosystems. This is the arrival venue for the water rafting. There have a plenty of durian tree. has been inform that normally the durian will drop on afternoon or night. Recycle bin from recycle stuff. Made by washing machine part & speaker. This how they transfer the guest to the water rafting area from earth camp which is located almost 1km. This is not only the place for you guys have your meal but also use as hall. hw do u get those invite to events? Bro…now I'm intern with MyC! an event company.